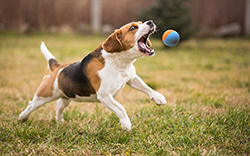 Playing fetch is one of the simplest ways to keep your dog entertained and active. Most dogs will have no problem spending hours chasing a ball if you let them. The activity feeds their primal need to hunt and retrieve prey. While a bright yellow ball is certainly not the same thing as a small animal, a game of fetch is enough to satisfy any dog. Thanks to modern technology, you can give your pup the opportunity to play fetch all on their own. Automatic dog launchers are a modern take on a classic activity. These fun toys will take your spot in the game so that you can sit back and watch your dog have fun. They'll throw the ball far enough for your dog to get plenty of exercise. Your pup can then drop the ball back in to go for another round. They can be great for dogs that suffer from separation anxiety or boredom. Simply set the toy up for your dog before you go to work and let them go crazy. There are a number of launchers on the market today. They all feature unique designs and a variety of features that allow you to customize the way your dog plays. Here are some of the best launchers to treat your canine companion. This launcher from iFetch can keep your dog guessing every time. It's capable of throwing standard tennis balls 10, 25, or 40 feet away. You can specify the distance you want with a simple flip of a switch. By doing so, you can easily set up the device in an indoor play area. There's also a random setting that changes the distance with every throw. The launcher has a unique shape that's designed to promote safety. The ball chute is located on the back while the launching mechanism points forwards. The ball is thrown almost immediately after the ball is dropped into the chute to prevent injury. It's powered by an internal rechargeable battery for versatility. This versatile launcher can be used inside or outside depending on your needs. It's also compatible with durable foam balls, rope balls, or standard tennis balls. 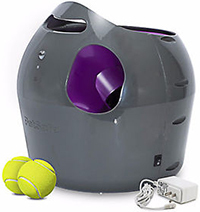 The square unit features a large ball return funnel on top that's easy for dogs to understand. The launching mechanism is placed on the side of the device. For maximum safety, you'll need to teach your dog how to load the ball in from the back or side. It includes multiple distance settings up to 50 feet and a random mode to challenge your dog. A remote control, rechargeable batteries, 2.5-inch tennis balls, and an AC adapter are included. This options from PetSafe is designed to teach your dog how to play safely. 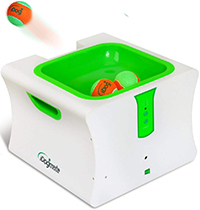 It features audible tones to alert the dog when the ball is about to launch. If your pup is standing in front of the launcher, it won't fire off. The built-in motion sensor is capable of detecting dogs and humans up to seven feet away. Not only does this help make the toy safer, but it can also teach your dog proper usage. The launcher can throw balls up to 30 feet away and in multiple angles. A simple knob is used to change settings on a whim. With its simplistic design and easy operation, you won't have any problem getting your dog to use this toy. It features a large ball chute in a contrasting color for easy training. You can set the throw distance to short for indoor use. If you plan to use it outside, it also has a medium and long distance mode. A single button is used to cycle through the settings. To ensure that you're in the right mode, the launcher has an LED indicator light. The device must be plugged into an outlet to operate. 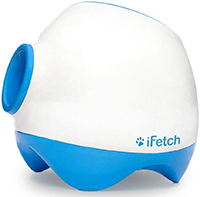 This option from iFetch has many of the great design features of it's larger counterpart in a much smaller package. 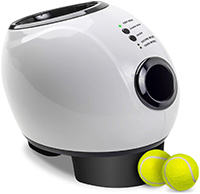 It's specifically designed for smaller breeds and uses miniature tennis balls that are only 1.6-inches in diameter. The body of the launcher has a whimsical design and is made of durable plastic. Like the larger model, it has a sizable return chute that's placed on the back for added safety. It can be set to throw the balls 10, 20, or 30 feet. The product can be used inside or out thanks to the rechargeable battery and included wall adapter. If you want a toy that can praise your pup as they play, consider this launcher from Etna. It features recorded voice commands that are played each time they put a ball in the chute. When the ball is dropped, it'll praise them for doing a good job. When the next ball launches, it'll give them a command to go fetch it. It features a large funnel on the ball return chute for easy operation. You can use it with a separate AC adapter or C batteries. It uses small miniature tennis balls and is capable of throwing them up to 12 feet away. Specifically made for smaller dog breeds,this automatic launcher from Paws & Pals can be used in the yard or inside your home. The body of the device is made of thick plastic for durability. The launch point is positioned on the front while the ball chute is placed on the back for ultimate safety. You can set the launcher to throw balls at 10, 20, or 30 feet with a simple press of a button. It includes a built-in rechargeable battery, charging cord, and three miniature tennis balls so that you can start training your pup right away. Automatic launchers can be great for you and your dog. One of the most immediate benefits it offers is that you don't have to be there. Your furry friend can play with the toy and get all the physical exercise they need without you. While this may be viewed as a negative for some people because of the lack of interaction, it's very advantageous for people that aren't able to throw a ball manually. Owners that suffer from disabilities or have experienced a recent injury may not be able to throw a ball comfortably. 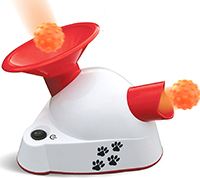 With an automatic launcher, your dog can still have fun. It's also great for people with busy schedules that don't want to be physical after a hard day of work. Whatever the case may be, it's good to look at automatic launchers as a positive investment for your pup. Even if your dog plays with the toy all day long, nothing will replace the joy they get from playing with you. Beyond the benefits that they provide to you, automatic dog launchers can do a lot for your dog as well. When properly trained to use the unit safely, a launcher can do wonders to your pup's physical, mental, and emotional well-being. Cardiovascular exercises like running are a crucial part of achieving better overall health. Dogs need to be able to go for a run a couple of times a day to ensure that they can burn off calories and avoid weight gain. If you're unable to walk your furry friend around the block, an automatic ball launcher can help. Your dog will be able to work their muscles and improve blood circulation throughout their body. Dogs can experience anxiety just like humans. However, a dog's anxiety manifests itself differently. Your dog may start to exhibit bad or destructive behavior. One of the best ways to reduce stress and anxiety is to exercise. By using a ball launcher regularly, your pup will not be able to focus on the negative feelings they have. They'll be too busy playing and having fun. Over time, the activity can result in positive personality changes. When you go to work for the day, your dog has nothing to do but lounge around. Most dogs will get bored pretty quickly and start to sniff around for something to chew on so that they can stay occupied. This type of destructive behavior can be remediated with an automatic launcher. Your pooch will be able to stay entertained and you'll be able to come home without having to worry about cleaning up torn pillows or garbage. Dogs are complex creatures with complex needs. While most people think that canines are content doing nothing, they need some mental stimulation. Without it, they can become anxious or depressed. Something like an automatic launcher can provide some much-needed stimulation. Operating one of these toys requires coordination and critical thinking. Even once the ball is launched, your dog will continue to use his mind to figure out how they're going to catch it. Mind games will make your dog smarter, which can ultimately prevent behavioral problems in the future. If you're on the hunt for the perfect automatic ball launcher for your dog, there's a lot to consider. Not all launchers are made the same. Small design choices can have a huge effect on how effective it is for keeping your dog entertained. Here are some things to think about while you search. The size of your dog will determine what types of launchers you can get. While many are designed to work with standard tennis balls, others use proprietary products of different sizes. This can prove to be a problem if you don't check with the sizing requirements of the toy. For example, if you purchase a launcher that uses tiny 1-inch balls and attempt to use it with your large Great Dane, your canine companion is at risk for choking. You need to make sure that the compatible ball sizes are safe for your pup. Launchers that use standard 2.5-inch tennis balls are ideal for medium and large dogs. Many manufacturers offer products that are catered to specific class sizes. 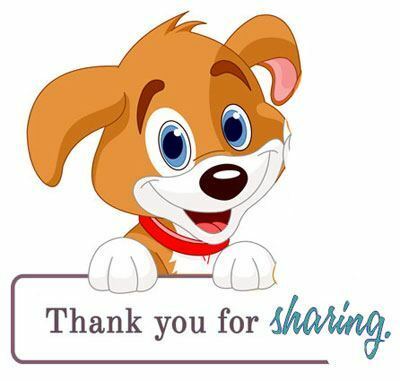 If you own a small breed, you shouldn't have a problem finding a device for your pooch. As with any device you let your dog use, launchers need to have a high-quality build that can withstand some chewing. There's always a possibility that your dog will attack the toy or drag it around the yard. This is common when you first introduce it to them. Launchers can alarm your dog due to the noise they produce. To ensure that the launcher can make it through the training process, go with something that's built to last. Thick plastic is a great option. If the unit is somewhat heavy, this may also deter chewing. It's important to think about how the launcher is going to receive the power it needs to operate. Some products utilize an AC adapter that can be plugged into any standard outlet. If you go with one of these launchers, you're going to need to place it in an area that has access to an outlet or extension cord. There are also launchers that use battery power. They offer more flexibility with placement but you'll need to consider the battery costs over time. It's a good idea to find a launcher that's capable of throwing a similar distance to what your dog is comfortable with. If you typically throw the ball all the way to the other side of the yard, a few feet from an automatic launcher won't excite your pup. Luckily, many products have adjustable settings that allow you to set distances to your liking. Throw distances can vary dramatically from one product to another. Units made for inside use may only throw the ball 10 feet away while robust outdoor models can often go up to 50 feet. The key is to determine where you'll be placing the device, figuring out what your dog is comfortable with, and finding a launcher that meets your requirements. While most don't realize it, your dog is going to need some training before they can use an automatic launcher on their own. To speed up the process, you can find a device that's very easy to use. The hardest part for a dog is figuring out how to reload the ball. For most models, this requires dropping the ball into a chute. With a larger chute, your furry friend will have an easier time figuring things out. Teaching your dog how to use an automatic launcher safely is crucial. These toys can do a lot of harm if your dog is not properly trained. One of the most common ways dogs get hurt is by standing too close to the launcher after reloading the ball. When the ball launches, it can hit them on the head and cause serious trauma. To avoid this, you need to teach them how to wait in a safe position. You can teach them to wait behind the launcher or off to the side. The important thing is to let them know that standing in front of the launcher is not a good thing. You can do this by turning the device on and off when they get into the right position. Once they drop the ball in the chute, turn the device off and show them where to go. Once there, offer some praise and turn it on again. They'll think that that going to that spot is a crucial step in getting the ball to launch. During the training process, you need to supervise your pup at all times to ensure that they're staying safe. When you're confident that they know what they're doing, you can start to let them have fun on their own. An automatic dog launcher is a worthy investment that can provide your pup with hours of enjoyment. With a high-quality launcher, you can rest easy knowing that your dog is having fun and getting the exercise they need safely. Also Read: Could your Dog be Autistic?